The next 30 years will be a defining era for the American healthcare system, as the number of adults aged 65 and older will double to nearly 90 million people by 2050. Amid an already stretched infrastructure, plagued by rising costs and a shortage of skilled workers, the Baby Boomer generation — the largest in history — ages into the most demanding segment of healthcare consumers. The healthcare system is scrambling to develop products and services to meet the physical needs of tomorrow’s aging population. Meanwhile, the emotional needs of this youthful, tech-savvy, and fiercely independent generation are not fully understood. There is a gaping market need for efficient solutions that engage older users in the latter leg of their health journeys. 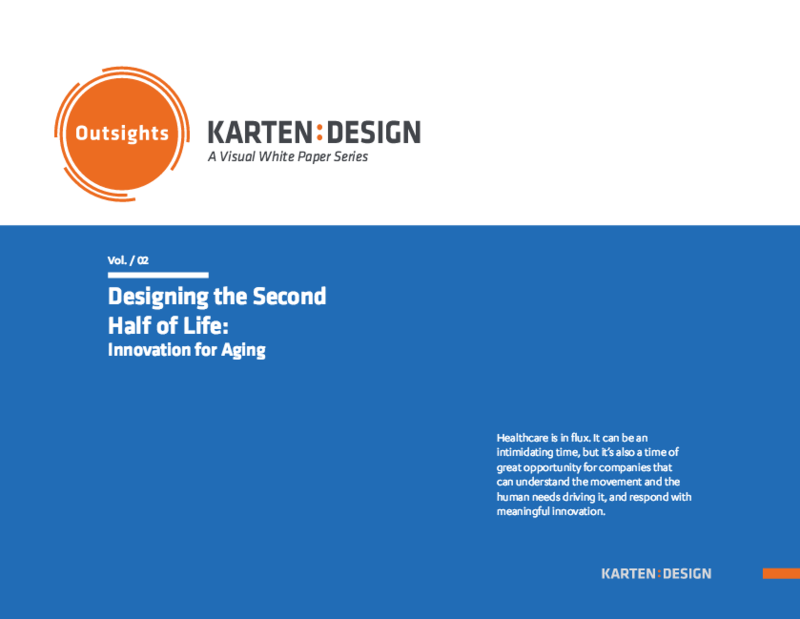 Karten Design believes that design and innovation can help the healthcare system weather the “silver tsunami,” and transform aging into an enjoyable, meaningful experience for older Americans.